The CABE Experiment and housing design: where have all the leaders gone? Here at The Bartlett, UCL we recently completed a major study of the eleven years of publically funded CABE, the Commission for Architecture and the Built Environment. We evaluated the work, history, and impact of the organisation, and the ‘tools’ it used to promote good urban design across England. When it came to housing design CABE had real impact and, as we argue here, the leadership it provided is sorely missed. But there are ways that planners, urban designers and the government can draw on the CABE Experiment, which will be increasingly important in light of the intended increase in the volumes of housing being built. CABE was never well understood. External perceptions were often of a monolith swallowing up huge dollops of tax-payers’ money to conduct design review. As we reported in our book Design Governance: The CABE Experiment, the organisation was tiny by government quango standards, and only around a fifth of its staff were dedicated to design review. The rest of the staff worked on lower profile but typically highly regarded and effective activities such as: enabling within local authorities; its research projects; the work of its public spaces and parks arm (CABE Space); production of its very well used guidance and website; and various educational enterprises such as its summer schools. These ‘informal tools’ of CABE were not mandatory or statutory and instead influenced and guided the professions. Yet they created a culture that improved design, for housing as for many other aspects of place. The work of CABE even reached some, although not all, of the volume house builders. Such progress will easily ebb away without continued efforts and leadership. But how did improvement happen? In addition, the Building for Life consortium helped establish nationally acceptable standards and an awards system for the best housing designs. And last but by no means least, government strengthened national policy, including on highways design in residential areas. Since CABE’s demise we have seen a large scale withdrawal of government, at national and local levels from engaging in design, and a fragmentation of the non-governmental design governance services that remain. We have also seen a retrenchment of house builders, highways authorities, and planning authorities across the country back to the old ways of doing things. Respectively, these are based on standard (and inappropriate) housing types, rigid and over-engineered highways standards, and planning authorities without the time, skills or confidence to challenge the house builders. This is not to imply that nothing is happening. The Place Alliance provides a forum for ‘grassroots’ exchange and, bubbling up from these connections, UDL initiated and lead the work to produce a collaborative and comprehensive guide: The Design Companion Planning & Placemaking. This publication demystifies the principles behind ‘good places’ and explains with detailed examples how planners and placemakers can deliver the highest standards in urban design. In addition the largest metropolises particularly benefit from local leadership, particularly the Mayoral SPG for new build in London and Manchester’s City Council’s guide. However without the national coordination of such initiatives, housebuilders can and surely will cherry pick where they build quality homes. Show leadership: Minsters should speak out when residential design is poor and celebrate it when it is not, and appeal decisions where residential schemes were rejected on design grounds can provide rich illustrations for that work. Support proactivity in local authorities: LAs can move away from reliance on generic policies in local plans and prepare simple non-statutory site-specific frameworks and design codes for housing sites. Promote design review: This constructive peer-based checking and refinement mechanism should be made compulsory in the forthcoming revised National Planning Policy Framework (NPPF) for all major housing schemes. Speaking up for better places and better homes will help those who are working on the ground, and as Design Governance: The CABE Experiment shows, this can have a great effect. With little cost and no new legislation we can once again drive design quality up the national agenda. UDL (2017) The Design Companion Planning & Placemaking. London: RIBA. The Place Alliance were winners of the Sir Peter Hall Award for Wider Engagement in 2016’s RTPI Awards for Research Excellence. This award was sponsored by the Idox Information Service. Idox is pleased once again to be supporting the RTPI Awards for Research Excellence for 2017. The awards are intended to recognise the best spatial planning research from the Royal Town Planning Institute’s accredited planning schools, and to highlight the implications of academic research for policy and practice. In addition, the awards recognise the valuable contribution of planning consultancies to planning research and promote planning research generally. As the UK’s leading provider of planning and building control solutions to local authorities, Idox actively engages with issues affecting the planning profession. Here at the Idox Information Service, we see our core mission as improving decision making in public policy by improving access to research and evidence, and we are proud to be playing a part in these awards to promote academic, researcher and student excellence in this area. 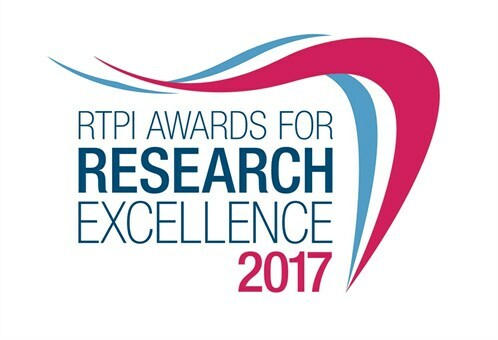 This is the third time that Idox has given its support to the RTPI Awards for Research Excellence. In 2015, and we sponsored the Student Award, won by Emma Thorpe, a student in the School of Planning and Geography at Cardiff University. Idox also sponsored the Sir Peter Hall Award for Wider Engagement Award, won by Dr Paul Cowie from Newcastle University’s School of Architecture, Planning and Landscape. Paul went on to write a guest blog post for us describing his innovative project, which uses theatre to engage communities in planning. Last year, Idox again sponsored the Student Award, which was won by Adam van Heerden, of the University of Cape Town, for his research engaging with a marginalised group – the ‘Skarrelers’ in Cape Town’s southern suburbs – who survive on the margins of prime urban spaces by either selling or re-using discarded waste material with value. The Wider Engagement award was won by Place Alliance – a national movement campaigning for high quality places. In addition, we sponsored the 2016 Planning Consultancy award, which was won by Ryden (lead consultants) along with WSP and Brodies, who delivered the Planning for Infrastructure Research Report for the Scottish Government and Transport Scotland. In 2017, Idox is pleased once again to be sponsoring the Student, Wider Engagement and Planning Consultancy awards. Further details on the five award categories, application guidance and entry forms, are available here. The closing date for applications to the awards is 19 May 2017. The finalists will be announced on 24 July, with the winners being named at an awards ceremony in Belfast City Hall on 12 September. The Idox Information Service is the first port of call for information and knowledge on public and social policy and practice. For 40 years the service has been saving its members time and money, and helping them to make more informed decisions, improve frontline services and understand the policy environment. In partnership with RTPI, the Idox Information Service has introduced an individual membership offer, which provides a 30% discount on the normal price.